I want to welcome our first guest photographer to Arkansas Wallpapers, Brian Cormack! Brian has been photographing Arkansas for many years and is a great friend of mine. This month he brings you photos from a recent trip to the Great Smoky Mountains National Park in Tennessee. 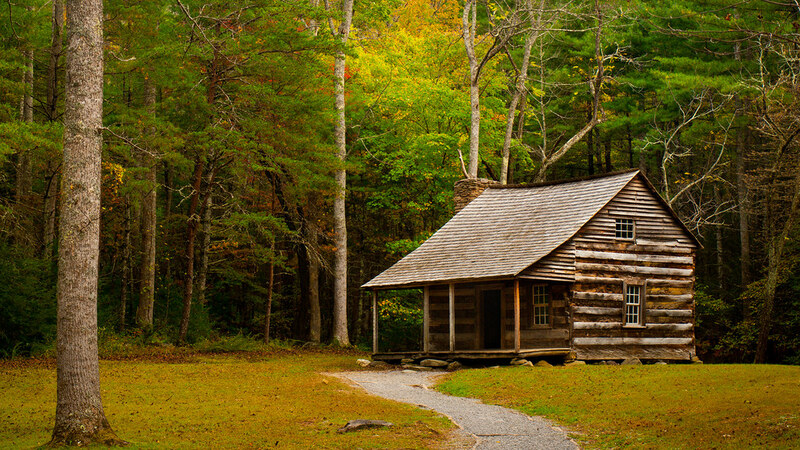 Cades Cove is a beautiful area, a small valley with a collection of well preserved old cabins and churches. It is also a frustrating area to visit, since it is the most popular place in the park. Unless you’re there in the morning, traffic along the narrow one-way road will inch along at a glacial pace. Long lines of cars drag along, where you’ll feel like you see more of another car’s back bumper than you do actual scenery. When you can get away from the traffic, there are some neat places. The old Carter Shields Cabin is one of the last stops on the drive, and was built in the 1880s.